The Loreto Peace Club carries out several activities with funding and support from the Mennonite Central Committee (MCC). Between 29th and 31st March 2019, the peace club students hosted 31 girls from the Loreto Primary School for the Big Sister / Little Sister Weekend event, referred to as ‘Nyankai’ in the local Dinka language. It is an opportunity for them to give insight to their younger sisters and share life experiences with them as they learn from and encourage one another. On Saturday morning, the upper primary girls enjoyed cookies prepared for them by their big sisters. They then worked on art in groups with their big sisters helping them to draw and design cards. This session was used to help them relax and talk about peacebuilding. According to one peace club member Rena Evelin, “Today we drew flowers and other pictures with our little sisters. It is a learning activity because both teams learn new things from each other. We also taught them how to draw the birds as we were taught in art classes and they taught how to draw very nice flowers since they know how to draw flowers better than us. The big sister event is good and next time we will even make it better. During Listening Circles (a trauma healing tool), the little sisters shared their personal feelings and emotions, describing challenges they face at home and in daily life. The big sisters served as advisers and offered their little sisters support and words of encouragement. They also talked about academics, explaining how to balance studies and domestic chores at home. 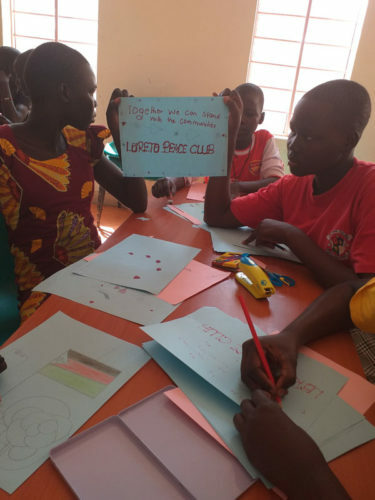 The girls discussed the importance of peace and encouraged each other to be agents of peace and reconciliation in their daily lives. 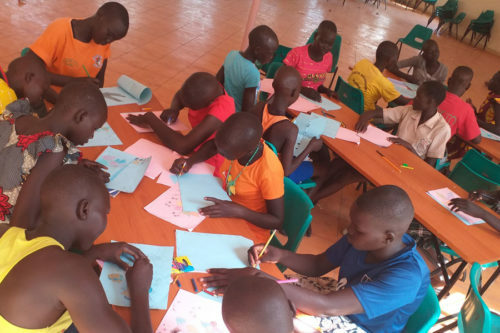 Collectively, these sessions are educational and serve to promote peacebuilding, trauma healing and resilience among the girls because they provide a place for them to freely discuss their experiences. It is my first time and the experience is wonderful. We have learnt that respecting each other and living peacefully is very important. We feel encouraged spending time with our elder sisters”. 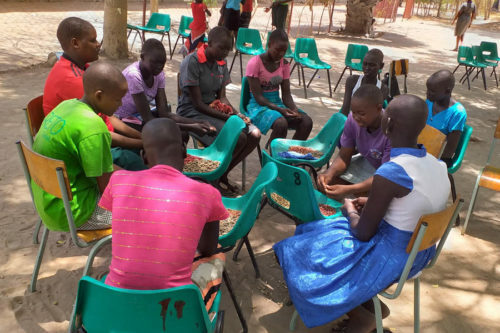 Over the two days, the little sisters have an opportunity to become familiar with boarding life as they interact with the other secondary students, taking part in sports, and enjoying weekend entertainment activities like movies. Sunday was the last day of the event and the girls interacted with the Loreto School Families after mass. 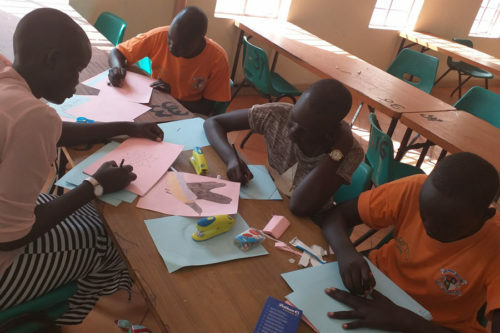 The School Families form an important peer-to-peer support system in the secondary school and help the girls to successfully complete their education. We hope that the lessons and moments shared during Big Sister / Little Sister Weekend will be of much help to all of the participants.